It’s so fun when a new yarn arrives. Shiny. Full of possibilities. Ready for swatching and the contemplation of designs. Our latest introduction is Santorini, and boy, are there a lot of possibilities! We’ve come up with some patterns that allow the yarn to sing – all found in the pattern book called Along the Shore. and you’ll have a really fun, colorful scarf. And then there’s the Sankaty cardigan. A great sweater for just about anyone. And how about a cute tank top? Nashawena fits the bill. 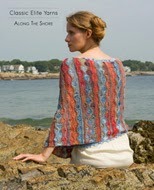 In all the excitement about patterns in Santorini (Sanibel’s cousin – you can knit any of these patterns in Sanibel too! ), let’s not overlook some other great patterns in Along the Shore. Tuckernuck in Sprout – a cropped cardigan for spring. Squibnocket in Chesapeake – looking for an easy-to-wear skirt? This is it! And two adorable tunics: Madaket in Firefly and Katama in Seeding. Throw on over white pants and you’re all set for the beach picnic! We also have three cute tops: Nonatum in Provence, Montauk in Cerro, and Tashmoo in Mesa. Pick the one that best suits your style (or all three?) and you have the summer season covered. Along the Shore can be found at your LYS, or online at ravelry.com. You can also find individual patterns on ravelry – stop by your LYS for them to help you make the purchase and while you’re there, they can help you find Santorini and other great yarns right in their shop! The ends were left exposed on this scarf. The scarf was knit with all ends showing on one side. 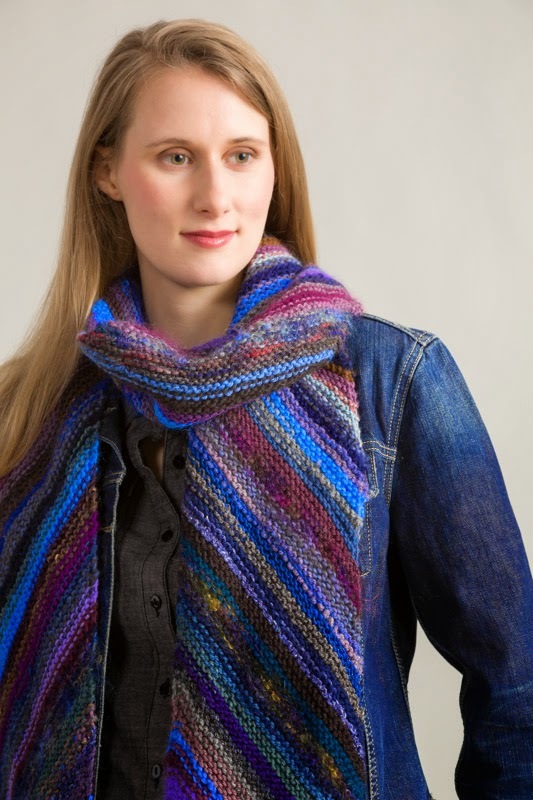 Magic Ball Easy Diagonal Garter Scarf "Recipe"
GAUGE is not crucial – choose a needle size appropriate for your ball of yarn. 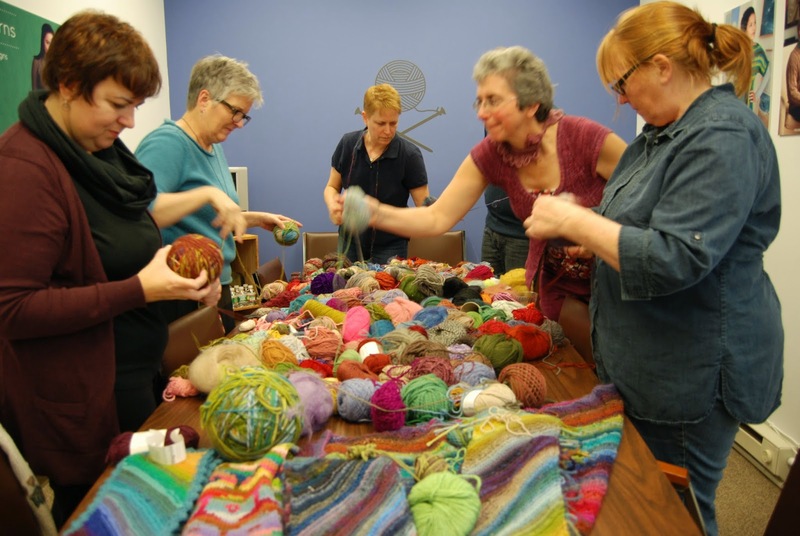 AMOUNT of yarn: The 72" long scarves shown used a magic ball that weighed approx. 10 to 12 ounces (approximately 280 to 340 g) and were primarily worsted weight yarns. Kfb: Knit into the front then the back of next st – 1 st increased. ssk (slip, slip, knit): Slip 2 sts, 1 at a time, knitwise to the RH needle; insert tip of LH needle into the fronts of the two slipped sts and use RH needle to knit them together -1 st decreased. Inc row: Kfb, k to end of row – 1 st inc’d. Rep Inc row until you have 40 sts (or any number of sts you choose). *Row 1 (RS): Kfb, k to end – 1 st inc’d. Row 2 (WS): K1, ssk, k to end – 1 st dec’d. Rep from * until longer side measures desired length. Every row: K1, ssk, k to end of row - 1 st decreased. Work Dec section until 2 sts remain. Diagonal Scarf with ends woven in, for a more "finished" look. Make your own ball of yarn! 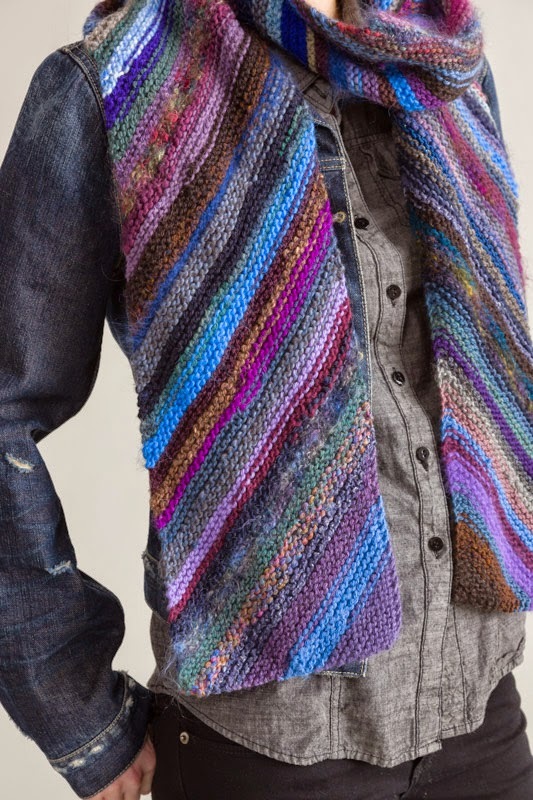 Have you seen those multi-colored, multi-textured novelty yarns where loads of different textures and colors are knotted together into one big magical hank of yarn? 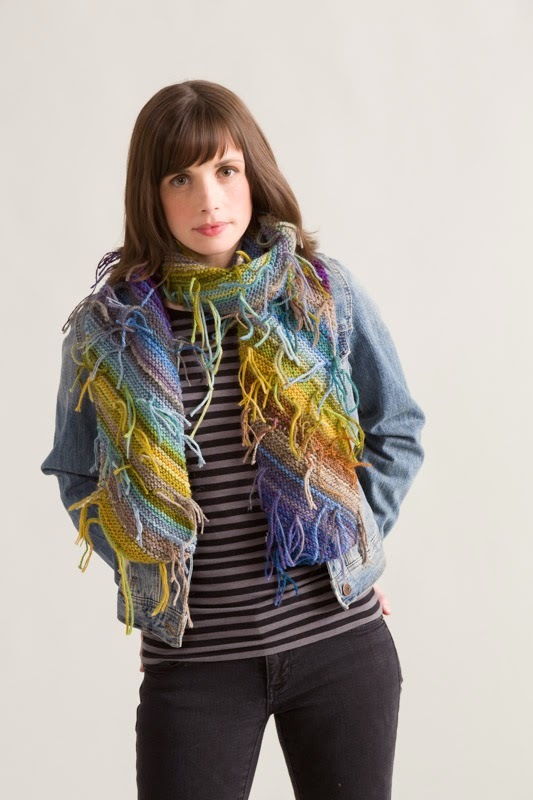 They make wonderfully colorful and unique scarves and cowls. 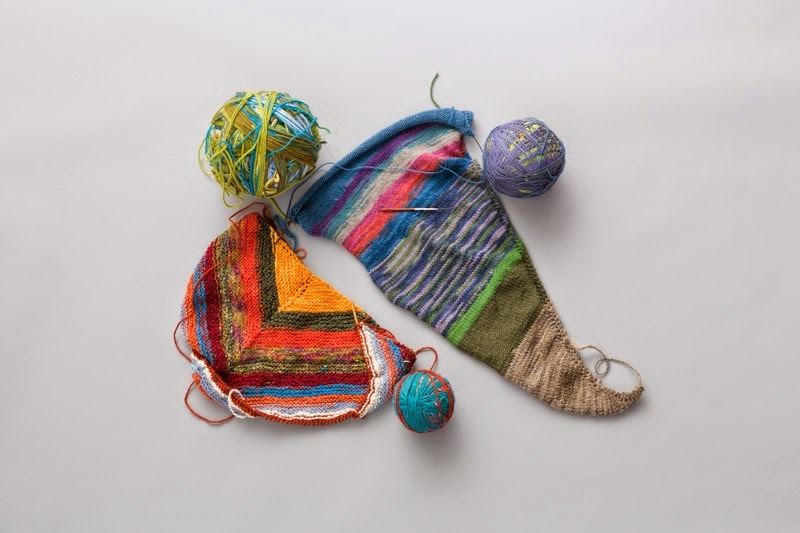 You can make your own magic ball of yarn AND use up your leftovers and odd balls in the process (allowing room in your stash to buy more yarn). The concept of the magic ball is not new – Kaffe Fassett made it popular decades ago and it continues to be a great way to gain confidence working with color. We decided to do a little de-stashing of our own. Here's how. Step 1: Gather all your odd balls and leftover bits of yarn. Dive deep into that stash – you probably have more than you think. 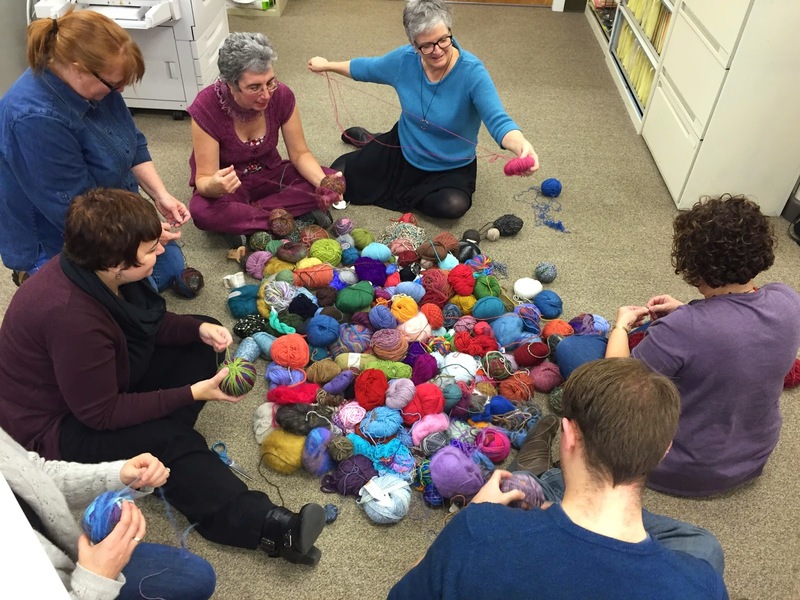 Throw a magic ball party with some knitting friends like we did at the Classic Elite office. Pool your yarns and wind the balls together. Even your most outlandish yarns will work – fun fur, bright acrylics, scratchy wools and spaced dyed yarns – all will work and add to the beauty of your magic ball. 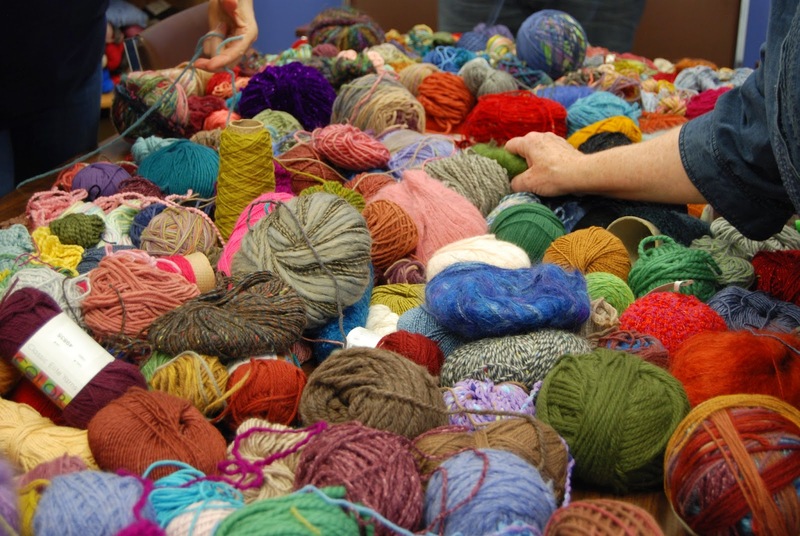 Make a big pile of yarn on the floor or a large table – you can’t have too much yarn! all from the same pile of yarn! Step 2: Start winding your ball. Choose a random yarn from the pile and cut a random length. *Choose your next yarn, cut a random length and knot it to the previous yarn with a simple overhand knot; rep from * winding as you go. Shorter lengths will blend colors together more easily but longer lengths will leave you with fewer ends to deal with. I usually make my lengths around 2 to 3 yards – but I don’t mind weaving in ends (more about dealing with the ends below). You can make each strand the same length or differ the lengths. About color: You can plan your use of color or choose each length completely at random for a more stripey or patchwork look. Blending colors, to make your magic ball look as if it is one multi-colored yarn, can be achieved by always choosing your next length to have “something” in common with the previous length – either a similar hue (color) or the same value (degree of lightness or darkness) or a similar saturation. Have fun playing color! Wind a rainbow ball by going around the color wheel. Or wind only analogous colors (2 or 3 colors next to each other on the color wheel) with the occasional pop of a complementary color (the color directly across the color wheel). Don’t worry too much about different weight yarns – the occasional heavier yarn won’t disrupt your knitting and lighter weight yarns can be doubled or tripled to become closer to the weight of most of the yarns used. Susan, Cheryl, Betsy, Andi, Chris, Heather and Tonia working on their winding. Step 3: Cast on and knit! Choose a needle size that matches the average of yarns used. 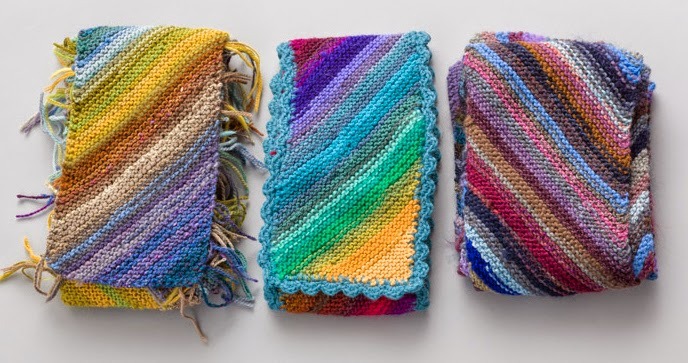 Garter, Stockinette stitch or other simple stitches work best – there is so much going on with the yarn, a more complicated stitch will get lost. As you knit, stop to admire your knitting often. Remember, you created the ball and you can change it too. If a certain length of yarn is not working, take it out and add another or knot the adjoining strands together. Magic Ball knitting in progress. 1. Weave in your ends. The method I use: Whenever I sit down and pull out my magic ball knitting, I first weave in the ends from the last time I knit, allowing me to admire my work and avoiding having all the ends to weave in at once when the knitting is done. 2. Untie the magic ball knots as you go and spit splice (if you are using wool yarns) or knit in your ends. 3. Let your ends become a “design feature”. Instead of weaving in ends, tighten and trim knots at yarn changes. You can also adorn your ends by adding beads. If knitting a garment, let the ends flow freely on the inside – No one will know unless you tell them. 4. Trim your ends and line with fabric - cotton flannel of micro fleece work well. Read further for instructions on making a scarf from the Magic Ball Scarf "recipe." And have fun with your stash!